The National Progression Award (NPA) in Food Manufacture at SCQF level 6 develops an understanding of the principles, structure, processes and procedures used in the food and drink manufacturing industry. The NPA is intended to be hands-on, reflecting the practical nature of food manufacturing. 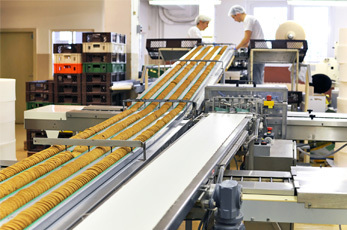 Candidates will gain knowledge and experience in the various areas of food manufacture. This qualification is widely available in colleges. The NPA is targeted at post-16 candidates, adult returners and employees of the food and drink industry. This NPA is suitable for candidates who have basic IT, communication and numeracy skills. It is anticipated that candidates will enter with Core Skills at either SCQF level 4 or 5. There is no automatic certification of Core Skills or Core Skill component in any of the four Units but aspects of the Core Skills at SCQF level 6 will be developed at the level of the Award. This NPA gives candidates a better chance of gaining employment in the food manufacturing and processing industry. Candidates who successfully complete the NPA may find opportunities to further their career in the food industry by being employed as team leaders or leading hands. There is potential for candidates to progress academically into higher/further education. The NPA in Food Manufacture and work experience could provide an alternative basis for entry to study for a degree. This would be at the discretion of the institution. Group Award Code: GF4N 46 at SCQF level 6. This National Progression Award in Food Manufacture at SCQF level 6 has four mandatory Units at SCQF level 6. It is recommended that the Units in this Award are taught in sequence, although all Units are discrete. The knowledge, understanding and practical skills gained by doing them in sequence will expand the learning base. There are opportunities for integrating learning and assessment across the Units. For example, the data collected during the Fundamentals of Food Science will provide the basis for understanding the principles and processes described in subsequent Units. It is recommended that each Unit is assessed using individual folios which include evidence of practical skills and tasks under open-book conditions. These may include outputs from group work but most of the evidence should be produced by the individual candidate. There is a closed-book aspect present in Unit 1 the Fundamentals of Food Science.